if John Kerry is confirmed as U.S. secretary of state, Gov. Deval Patrick must appoint someone to fill Kerry's seat until a special election is held. BOSTON — Liberal groups have launched twin online petitions aimed at pressuring Massachusetts Gov. 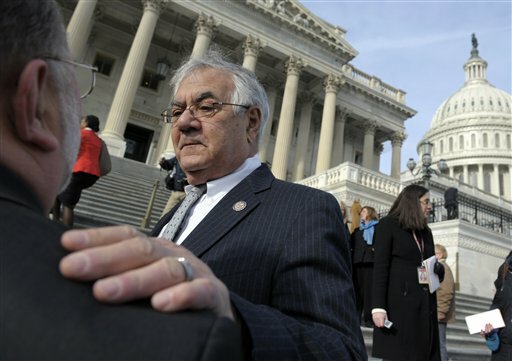 Deval Patrick to temporarily name former Congressman Barney Frank to Sen. John Kerry’s seat if Kerry is confirmed as secretary of state. The Progressive Change Campaign Committee, which helped raise money for Democrat Elizabeth Warren during her successful Senate campaign, has launched a new website and online petition. “We need someone who we are 100 percent confident will fight right alongside (Warren),” the petition adds. “Barney will take on conservative Republicans in Congress who want to cut Social Security and Medicare and play politics with the full faith and credit of the United States,” the petition says. Frank, who opted not to run for re-election after a 32-year career in the U.S. House, has taken the unusual step of publicly lobbying for the interim post. Patrick confirmed that he was considering Frank and believed he would make a “great interim senator,” but added that he has talked to other people about the position as well. Patrick must appoint someone to fill Kerry’s seat until a special election is held if Kerry’s nomination is confirmed. That special election would be scheduled for about five months following the Massachusetts Democrat’s resignation. It would be the third Senate election in Massachusetts since 2010. Patrick has said he won’t reveal his pick for interim senator until Kerry’s resignation is official. Kerry, who was nominated to the top diplomatic post by President Barack Obama, is not expected to run into serious opposition from his fellow senators during the confirmation process. Others mentioned as possible interim senators include Michael Dukakis, the former governor and 1988 Democratic presidential nominee, and Victoria Kennedy, widow of the late U.S. Sen. Edward Kennedy. Patrick has declined to confirm any other conversations he might be having with potential candidates, saying those conversations are confidential. He decided to confirm that he had spoken with Frank after the longtime Democratic lawmaker went public with his interest. Patrick has made it clear that he planned to choose an interim senator who was not interested in running in the special election. The winner of that race would serve out the remainder of Kerry’s term, which ends after the 2014 election.